Kluhor (Klukhor) Glacier is in the Caucasus Mountains west of Mount Elbrus. It drains into the Teberda River and then the Kuban River and eventually Krasnodar Reservoir and the Black Sea. The Krasnodar Reservoir is primarily a flood control and irrigation management reservoir. Here we examine three glaciers each experiencing the familiar pattern in the Caucasus Mountains of retreat with expansion of proglacial lakes. As the area and number of glacier is reduced, the number and area of alpine lakes is increasing, note Khimsa Glacier, Georgia, Psysh Glaciers, Russia, and Gora Bashkara, Russia. Stokes et al (2006) note that 94% of Caucasus Mountain glaciers retreated from 1985 to 2000 and it is clear from the aforementioned that the trends continues. We examine Landsat imagery from 1998 and 2013 to identify the change. 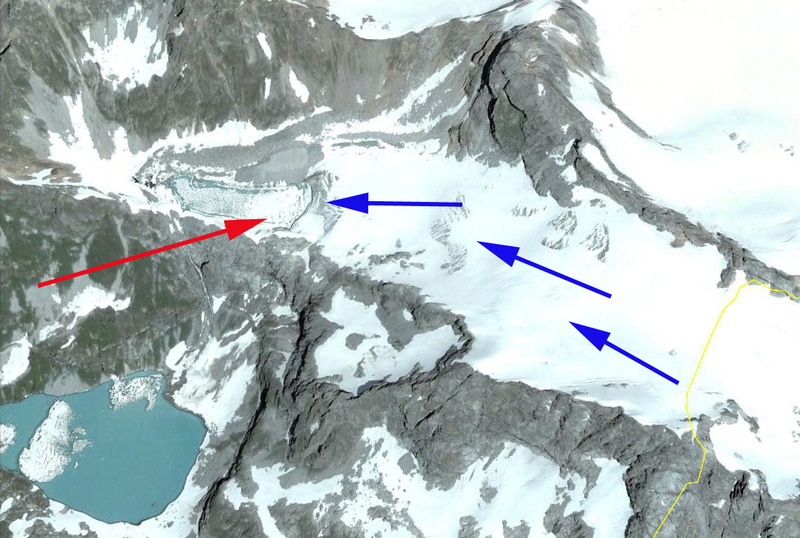 In each image the Kluhor Glacier terminus lake is indicated by the red arrow. 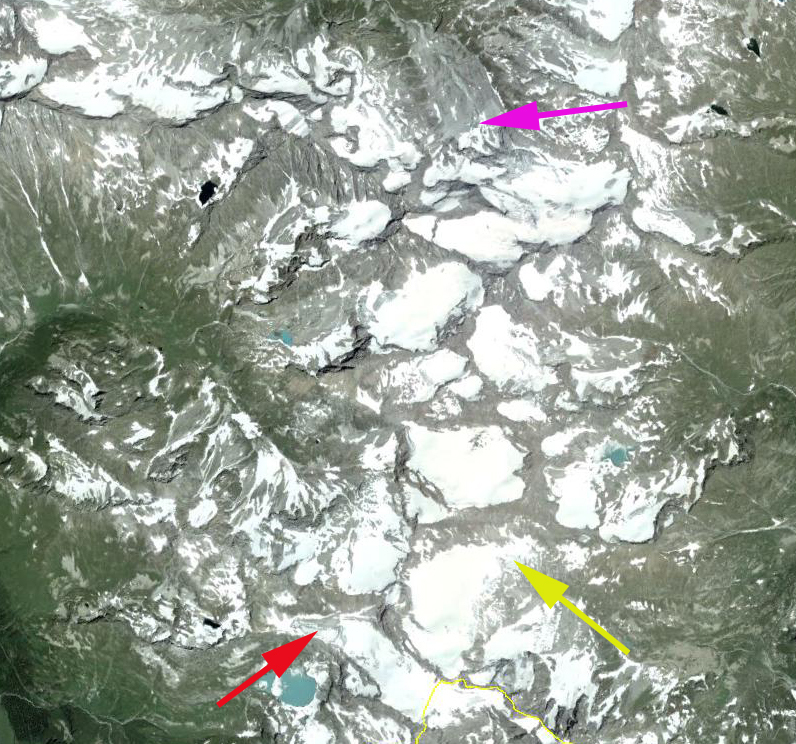 The unnamed Glacier here named east Kluhor Glacier terminus lake is noted with a yellow arrow. 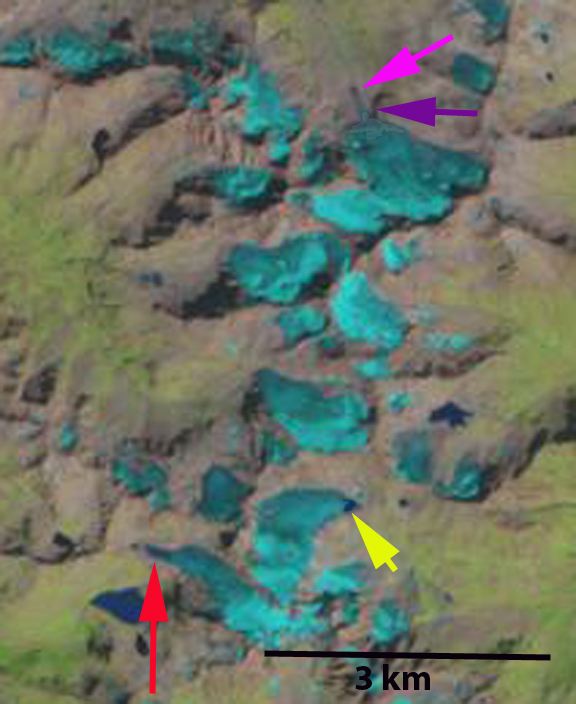 Another unnamed glacier on Lednik Daut is identified here as north Daut Glacier is noted by pink and purple arrows. In 1998 there is small lake at the end of Upper Kluhor Glacier, 150 m long, and on east Kluhor Glacier, 50-100 m wide. At north Kluhor Glacier the glacier ends at the base of a steep icefall near a third lake, pink arrow. 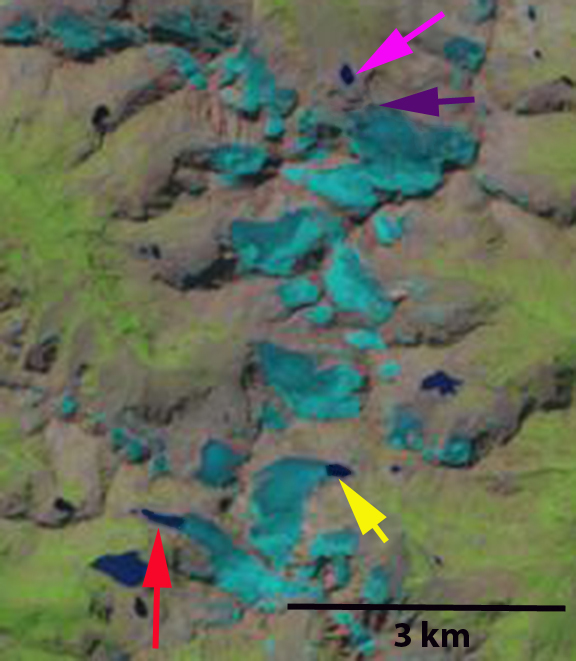 The purple arrow indicates the terminus of north Daut Glacier in each image. By 2013 Kluhor Glacier has retreated 300 m and the lake is 450-500 m long. The east Klhor Glacier has retreated 150 m and the lake is 250 m across. The north Daut Glacier has retreated to the top of the steep icefall slope, a 400 m retreat and is now quite distant from the lake below. The 2007 Google Earth image of Kluhor Glacier there are a number of crevasses paralell to the ice front, indicating that some calving losses will continue to occur. The glacier overall extends from 2950 m to 3250 m, is narrow and has limited snowcover in both satellite images. The snowcover extent in the August satellite images, well before the end of the melt season is 30%, whereas typically 55-65% is necessary to sustain a glacier. 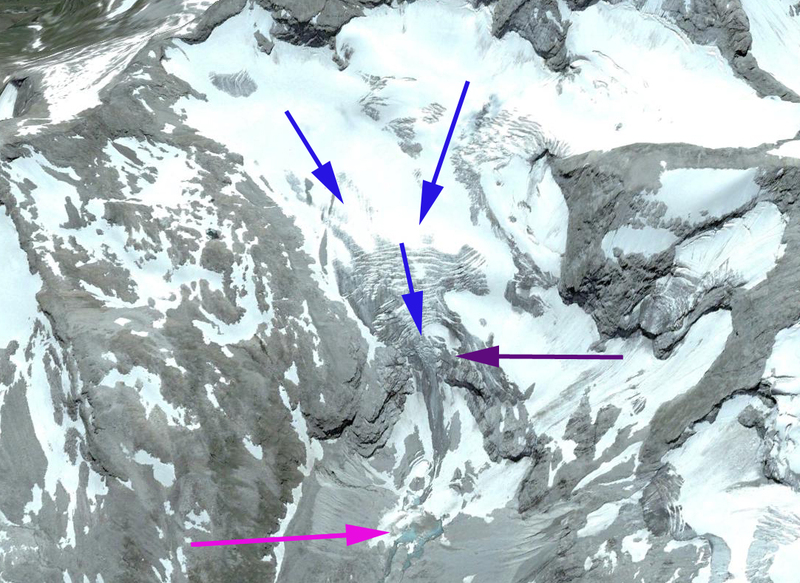 In the 2007 Google Earth imagery the thin nature of the icefall at north Daut Glacier is evident, that has since melted away. This entry was posted in Glacier Observations and tagged caucasus glacier lake expansion, Caucasus glacier retreat, Caucasus mountains russia glacier retreat, causcaus glacier melt, glacier global warming, Kluhor glacier retreat, kuban river basin glacier retreat. Bookmark the permalink.